On August 2011, couple of daytime Unidentified Flying Objects were accidentally filmed leaving volcano Parinacota, located on the border of Chile and Bolivia. Witness report: [translated from Spanish] I left the camera on a tripod filming a few minutes to make a "Time Lapse" while we were eating. At the time no one realized at home reviewing the clips I saw the objects and was quite surprised. You can see from the second 4 to 12 and then from 20 to 53. So they can better appreciate it, I show the video to scale back 150% and 500% speed and then again but with 500% increase in size. 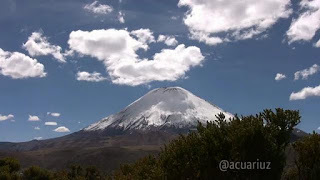 Captured by Canon HV30 on Sunday, August 21, 2011 at the viewpoint of Lake Chungará between 1 and 2pm. These Orbs around Volcanoes seem quite a common occurrence, however a far less explored phenomena as one would've liked in the quest for truth !